All the shots have been fired now. Microsoft, Sony, and Nintendo have each either debuted or have released their next-generation consoles. The WiiU has the lead this generation, but unfortunately hasn't garnered the user base advantage that the XBox 360 did for the current generation. 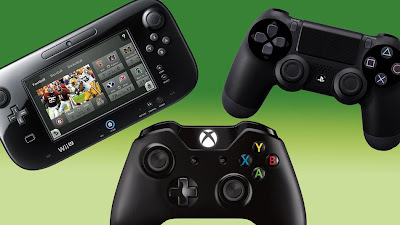 There are some common themes among the consoles: second-screens, motion control, and social. Nintendo has embraced the second-screen the most with its inclusion in the default controller for the WiiU. Having already had some experience using it I can say that it allows for some very interesting designs. Nintendo Land really shows off some of its potential, but other games like New Super Mario Bros. U don't do much interesting with it. Though the simplest use of it is as a duplication of the main screen so you can play games TV-less, which I've already found to be great. The PS4 is doing its second-screen implementation by making Remote Play with the Vita a core feature of the console. Remote Play is one of my favorite features of the PS3 (and something I was really hoping would be a core part of the Vita) and I'm very excited that it will be a more core part of the PS4. One advantage for remote play is that it can work non-locally, allowing you to stream content over the internet and Sony is requiring that Remote Play be worked into each PS4 game. The XBox One's second-screen comes in the form of SmartGlass, which we don't really know much about but should give applications additional content on a paired tablet device w/ SmartGlass installed. Each system's motion control is a continuation of what they did for the last generation. The Wii Remote motion control technology (but not the form factor) has been included in the WiiU Gamepad. It's also compatible with the Wii Remotes from the Wii. The PS4 controller has more advanced motion controls included in it than the PS3's Sixaxis had, as well as a motion controller-esque light on the front of the controller. They've also included a touch pad on the controller and it's compatible with the same motion controllers from the PS3. The XBox One is including a more advanced Kinect that comes with the console by default which must be plugged in at all time. The last shared feature among the consoles is social networking/sharing. Friends were a major addition to the current generation but social networking didn't really explode until after they were all out. The 360 came out in November 2005 and the PS3 and Wii came out in November 2006. Facebook didn't become open until September 2006 and Twitter started in July 2006 but didn't take off until much later. Social networks have become firmly embroiled in our everyday lives now and as such are becoming embedded in our next consoles. Facebook and Twitter are already in the Vita, which combined with the ability to screenshots makes it a great combination. Nintendo has set up its own social network for the WiiU that's based around various boards for each game, called the Miiverse, users can post screenshots and drawings to the Miiverse and ask for help from each other. The PS4 is getting close with facebook as well allowing users to upload videos of gameplay to various sites or even stream gameplay through UStream. The XBox One will also allow users to upload videos of gameplay to the internet and will no doubt have integrated social network features. They haven't been discussed at length yet, however. I've very excited for all the consoles. I'm most excited for the PS4 (I'll admit to fanboyism), but I'm expecting good things from all of them. The video uploading and streaming/sharing features look really intriguing and the second screen functionality I've experienced with the WiiU and with Remote Play for the PS3 give me great hope for how that's going to turn out on these consoles. With E3 coming up I'm really excited for what we're going to be seeing, more so than I've been in years. I'm hoping to hear more about the gaming features of the XBox One from Microsoft and I'm hoping to see more games from Sony and Nintendo. Which features and consoles are you most excited for?